From the perspective of someone who has put together a significant number of portfolios for academic assessment before, I must say that I have generally found them to be more of a box-ticking exercise than a tool for reflection. However, it quickly became evident that there were many different drivers at various institutional levels and across international contexts. Some themes appeared to emerge at the broadest level, and I was left with the impression that eportfolios are less of a pedagogical necessity than a reflection of changing social and institutional practices at a global level. I tried to be proactive with the task, bring the first person in my half of the group to contribute to the forums, writing about my experience of e-portfolios. However, I wasn’t able to log in regularly over the next few days, and classmates had assigned me a partnership with a person who hasn’t contributed. This made it hard for me to contribute in the proposed ways. However, I did write up some suggestions to do with UKHE and the HEA in the UK context (though by this time I think a number of students had taken it upon themselves to move on (probably fairly). However, it seemed to me that there was not enough discussion about how and why a wiki would be organised and too much discussion of technological solutions to colloborative working. I struggled to see the relevance of this task (at this level of detail) for H808. It now seems to me that the content of this task could be thought unimportant: the importance lies in the collaboration. However, I’m having trouble shaking the idea that this is as much about justifying the methods of assessment used in H808 as much as anything else. I was also a little uncomfortable with the focus on ‘drivers’. This is a business term which refers to factors that drive turnover and growth; but I want to talk and think about how people learn through technologies. 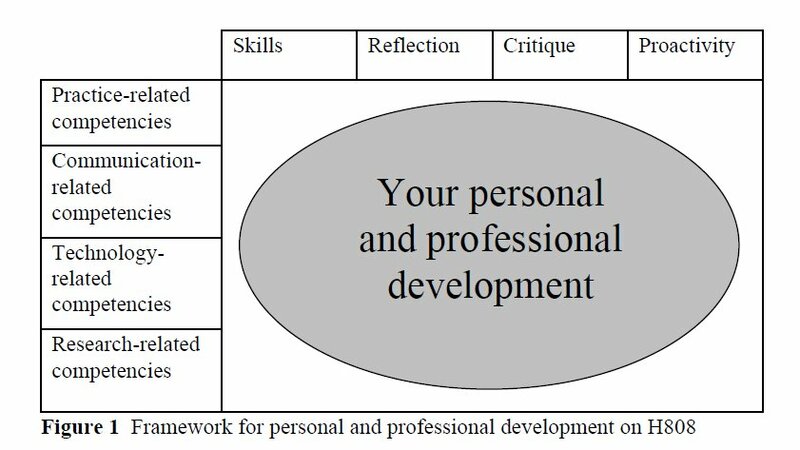 Here’s the framework that we are encouraged to use for reflecting on our development over the life of the course. To a limited degree, I would say that this activity could be used to indicate a basic level of (technology-enabled) communicative competence in terms of group collaboration, and research skills in terms of reading & understanding the provided materials and finding new sources. Primarily for me it has been useful as an exercise in reflection… thinking about the course and what it holds, how my own skills cohere with the skills being expected of students on a course like this, and so on. I suppose that what I’ve written here could also be considered critique. Rob, a good critique. Your last two paragraphs show that you did get something out of this task, also including reflection. Do you think that elearning professionals would use pedagogically sound methods through a variety of technologies? I agree though, that in this instance there was a lot of discussion of technology ‘how-tos’ rather than of drivers. This seems to be cross-tutor groups and is unusual. It could be that when people join a course and are not totally au fait with the technologies involved, that they worry more about this at the outset. Rob, I agree that there was a certain something lacking in discussion about the drivers, but I do think the exercise was a success regarding collaboration. Whilst nobody volunteered to work with me on the Middle East (but, at our age, we are now quite capable of researching alone, without a partner, so that didn’t bother me!) , I contributed what I could find to the wiki, as did others for their areas… and consequently we have created quite a comprehensive resource. Success!! !